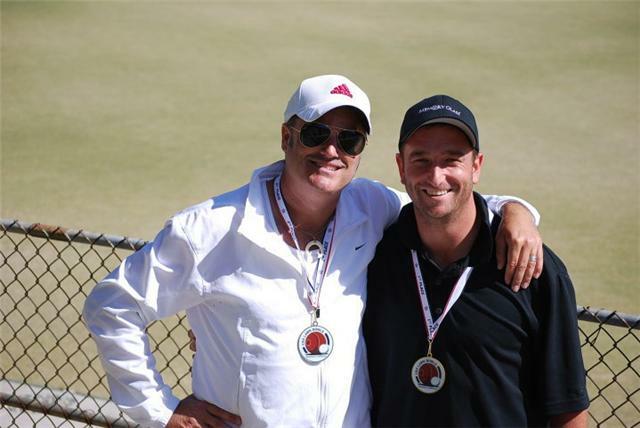 Loren Dion from Mackenzie Park, Santa Barbara California took home the Singles title at the Southwest Open that was played in Santa Anita last week. What a fun week of bowls! Full entries of 36 and 48 teams in the trips and pairs respectively, and 44 entries in the singles…San Diego/Newport powerhouse team of Herbert/Smith/Brault took down the pairs, steamrolling their way through playing their own syle of bowls. In the pairs, a GREAT semi was played between myself, Joe Regan (my lead), Steve Bezanson (s) and Bill Pearson (l)…down 8-1 to some great bowls by their opponents, Joe and I had to step up (along with get a couple unlucky results by Bezanson) to come back and even be up one coming home! After killing the final end twice, Bezanson and Pearson finally got the one they needed to force the extra end. Pearson played a masterful 15th to leave me looking at a bowl-bowl-jack head and not too big a target going to the mat. With bowl 1, I hit the edge of the shot bowl with a great drive just springing the jack back enough to be holding one…this one held up and I added another to leave Bezanson 2 down and without position. His only option was to kill the end….he hit one of the shot bowls, richocheted into the other to turn it over and to now be holding shot within 3 inches! With my last draw I came up high and handsome and missed, so Bezanson and Pearson won. A game for the record books. In the singles, Bezanson and I met again in the quarterfinals this time. It was a tough game on a difficult rink and in some heavy wind. I pulled it out 18-14 but it wasn’t neccessarily pretty. The semi I was playing better and beat a fairly inexperienced Marty Bierman 18-5. The other semi was a great game with a crazy ending…Tony Baer was vs. my pairs partner Joe Regan. With only one bowl in hand, Tony was holding game as the score was 17-16 in his favor and he was holding one. On a weird windy hand, his last draw attempt accidentally clipped in Joe to be holding one….on Joe’s last, and last of the game, he drew #1 to win it 18-17….feel bad for T.
In the final Joe and I had a great match in some crazy wind and I got it 21-11. Great week with a lot of fun times and my first big singles win, sweet.